« Invasion of the Giant Bacteria – Our GGJ 2011 game! I need someone to help me make some new art for the game ranging from as little as some new UI elements to a full overhaul depending on how much time the artist has spare and what my budget can stretch to. I can pay some cash for the art now and I’m also offering royalties after the game has launched. I’ve made 6 commercial casual games and worked on a Facebook game at Big Fish Games, so I know what I’m doing – this project will make money. If you are interested, please send relevant examples of your work to me. I need to see cute looking UI stuff, and cute characters and objects suitable for a casual game e.g. bunnies, chicks, Easter eggs, flowers etc. 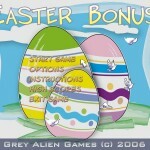 This entry was posted on Saturday, February 5th, 2011 at 2:50 am and is filed under Grey Alien Games. You can follow any responses to this entry through the RSS 2.0 feed. Both comments and pings are currently closed.